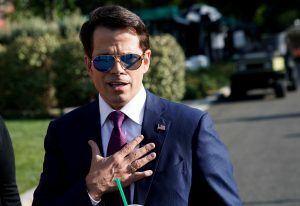 WASHINGTON — President Donald Trump’s new communications director exploded the smoldering tensions at the White House into a full-fledged conflagration Thursday, angrily daring Trump’s chief of staff to deny he’s a “leaker” and exposing West Wing backstabbing in language more suitable to a mobster movie than a seat of presidential stability. Not even a week into his new job, Scaramucci accused unidentified senior officials of trying to sabotage him and committing a felony by leaking information. But the personal financial information that he said someone had “leaked” about him had simply been obtained through a public records request. Then in an interview published by The New Yorker late Thursday, an angry Scaramucci used expletives to accuse Priebus of being a “paranoid schizophrenic” and White House chief strategist Steve Bannon of trying to burnish his own reputation. He also threatened to fire White House staffers who leaked about a dinner he had with the president. Scaramucci did not immediately respond to a request for comment about his inflammatory remarks. Neither did the White House. “There are leaks and then there are people using the press to shiv each other in the ribs,” she said. Meanwhile, no one in the White House took up for Priebus — including Priebus himself. Newly promoted press secretary Sarah Huckabee Sanders avoided giving a direct answer when asked whether Trump has confidence in Priebus. The past 24 hours provided the clearest evidence yet that Scaramucci and Trump, both brash New Yorkers, are cut from the same cloth. One of their shared techniques: publicly shaming members of their own team. Scaramucci’s goading of Priebus came as Trump continued to fume publicly and privately about his attorney general. Trump has been critical of Attorney General Jeff Sessions for recusing himself from the Justice Department investigation into whether the president’s campaign had anything to do with Russian interference in the election last fall. “It hasn’t been my best week … for my relationship with the president,” Sessions acknowledged in an interview with The Associated Press in El Salvador, where he was on a mission to increase international cooperation against gangs. Newt Gingrich, a former House speaker and frequent outside adviser to Trump, said in an interview that Scaramucci’s attacks on Priebus are problematic. “They’ve got to get this sorted out between the two of them, and it would be nice if they didn’t do it in public,” he said. Yet after Scaramucci’s call-in CNN performance — a move lifted from his boss’ playbook — it was difficult to see how the two could mend fences. “I don’t know if this is repairable or not — that will be up to the president,” Scaramucci said on air. He compared their relationship to that of brothers who are “rough on each other,” invoking Cain and Abel. One of those biblical brothers murdered the other. The bad blood stems from Scaramucci’s view that Priebus was insufficiently supportive of Trump at the end of the election campaign and his belief that Priebus persuaded the president to keep him out of the White House in January. Six months later, Scaramucci’s close relationship with the president trumped the opposition of Priebus and Bannon. Scaramucci’s arrival in the West Wing last Friday marked the first in a series of falling dominoes that seemed to be leading toward Priebus. Press secretary Sean Spicer, a close ally of Priebus, resigned last week. Scaramucci then forced out another communications aide close to Priebus. Scaramucci then tweeted that someone had illegally leaked financial information about him, conspicuously mentioning Priebus’ Twitter handle. Scaramucci later deleted that tweet and said he had only mentioned Priebus to show that all senior leaders are taking leaks seriously. “In light of the leak of my financial disclosure info which is a felony, I will be contacting @FBI and the @JusticeDept #swamp @Reince45,” his since-deleted tweet read. Scaramucci’s financial disclosure form wasn’t leaked at all. It was released after a public records request by a Politico reporter. In the CNN interview, Scaramucci said he’d be reaching out to his “buddies” in the FBI about the matter. If Scaramucci tries to direct the FBI to conduct a leak investigation, that could brush up against the Justice Department’s obligation to function independently from the White House, said Mark Zaid, a national security lawyer in Washington. “It starts to potentially smell and approach an inappropriate line,” Zaid said. Brad Gerstman, a New York lobbyist and public relations executive, said it probably doesn’t matter to Trump that Scaramucci and Priebus don’t get along. Gerstman has done projects for the Trump Organization and is a neighbor and longtime friend of Scaramucci’s. “In my experience, he’s of the belief that sometimes a little friction in the ranks is how you surface the best ideas,” Gerstman said of Trump. But another rule of thumb in Trump’s inner circle is that it’s never wise to outshine the president. Trump has reacted angrily when certain aides — including Bannon and, briefly, son-in-law Jared Kushner — received outsized media attention. Associated Press writers Vivian Salama, Eric Tucker and Jill Colvin contributed to this report. Left: White House Communications Director Anthony Scaramucci went after chief of staff Reince Priebus in graphic terms in an interview with CNN. Photo by REUTERS/Joshua Roberts.